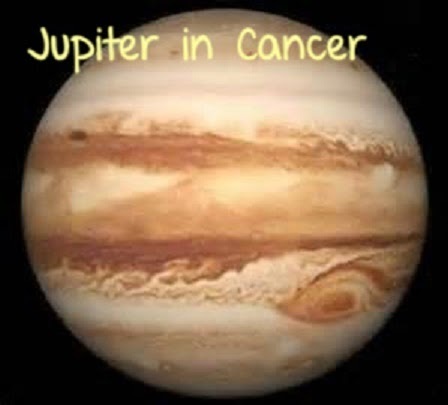 The new Astrological planets moves are going on, Jupiter will move to Cancer from June,19th 2014 and it will stay in Cancer till july, 14th 2015 (more than a year). It will affect each and every Zodiac sign and will give good and bad results for each sign, lets check how it is going to effect each sign with respect to moon sign wise. Aries :- The people who having Aries sign have good results with Jupiter moves in cancer, the luxuries will increase, good thing about domestic life. You may buy new car, house, or any other property, if you are thinking to buy one. Your fame and respect can also increase. If you are doing job then there are chance of promotion, you can aspect good changes in your job or business. Taurus :- yourself confidence will increase, people will start appreciating your work, your social circle will start praising you and your work, your fame will increase. You will start taking responsibility for your family. Chance of having short journey. Your marriage life will be good and stronger. You will get support from your partner and other companions. Will advise you to take care of your health and get blessings from elders. people’s expectation at your job or business. Cancer :- you start thinking conscious and optimistic but your intelligence will also help you to dealing with problematic situation or other difficult situation. In this period of time, you will be happy, overall. Your income will increase, chance of auspicious activity. There will be harmony among your family members. You will be bit philosophical in this period. Leo :- Jupiter plus venus also transiting from 12th house of leo, which is overall not so good. you will feel insure and start distracting from things. Better to keep up your focus and keep working on right things. You need to study and examine your opponent, and need to play smart. It will be advisable to you to avoid unwanted journeys as much as possible. Virgo :- your good side will improve on this period of time. This period is full of excitement; you may approach for new initiatives, which will bring new direction for your career. Your friends and family will enjoy your company. There is assurance of success for you in this period of time, if you participant in any competition. You may start meditation practice. Libra :- Jupiter to cancer plus venus also transiting from your 10th house, so it will be double good result for you people. You will do even better in your business. You will start executing your plans, there is also sign of growth in your job. There will be new opportunities in job and business for you. You will spend good time with your family. Scorpio :- There will be increase in your enthusiasm and confidence, you will enhance your success and gain more respect. There will be good atmosphere in your family, peaceful and harmony. There will be increase in your family member. You will be benefited from long journeys. You will be more religious also you will start yoga and meditation. Sagittarius :- Venus also transiting from 8th house of Sagittarius, which is not so good sign. Chance of feeling unstable, you may be physically weak. You will attract towards occult science. But there is some good sign also, like you may get big unexpected financial benefit. But be careful in making any investment. It’s time for you to become self dependent. Capricorn :- Venus also transiting 7th house of Capricorn, this will help you to accomplishment your wish. You will reach new heights in your career. Long time hurdle and interruption will end now. You will get new friends, and Success is assured in matters related to marriage. Your popularity and fame will increase. Aquarius:- you will start getting favorable results but you need to work hard. If you are doing job then you need to start working hard, better to stay focused and stay away from disputes. Play smart and study your opponent, not so good time for law and allegation. Pisces :- Overall good time is knocking your door. Chance of auspicious activity in your family. Think bit in decision making, success is assured for right decision. You will get profit in your business. Your friends will support you in business and in personnel life too. You will feel inclined toward religious deeds.